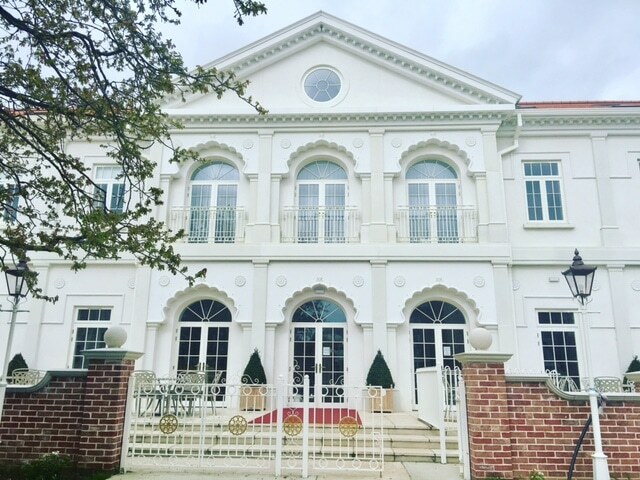 A visit to the Maharishi Peace Palace in Rendlesham, was long overdue. Here at CELLOPHANELAND* we have been practising Transcendental Meditation for several years now, and so an escape to the beautiful Suffolk countryside, and offer of total immersion in a blissful atmosphere was more than welcome. The 5M custom-built Peace Palace has been designed according to the precise guidelines of Maharishi Vastu, the ancient science of Vedic Architecture, originating in India which follows Natural Law, and thus, the principles in nature that organise everything from our human physiology to the evolution of the entire planet. Vatsu at its most authentic, is the oldest known architecture in the world, and just spending time in this type of building has a palpable, nourishing effect on the mind, body and soul. The scientically proven benefits of Vastu include improved health, vitality and wellbeing, stress reduction, enhanced focus, expanded creativity and intelligence, and improved sleep. TM retreats retreats are a wonderful way to recharge your batteries and if you are already a meditator, deepen your understanding of transcendental mediation through fascinating lectures and group meditations. These are usually in the form of day, weekend or week long retreats. There are also introductory talks, and you can learn TM over a long weekend or mid-week break. All courses are run by the Maharishi Foundation which is a registered educational charity. If you are not a meditator, it doesn’t matter, you can still stay at the Peace Palace’s on a B&B basis just to relax. We took advantage of the Peace Palace’s B&B wonderful offer. As Rendlesham is situated within an area of outstanding natural beauty, we were never far from unspoilt beaches, or wonderful cycle trails through the local forest. Snape Maltings is also close by with world class music at the Benjamin Britten hall. To complement the whole relaxing ambience, dining at the Peace Palace is a sheer treat. Delicious freshly cooked vegetarian meals, using only the highest quality organic ingredients, locally sourced wherever possible, aid the overall rejuvenation process. The menu includes gluten, dairy, sugar, low-fat and fat-free options. The emphasis on rest is very important and guests are encouraged to take the opportunity to switch off and have a total digital detox. There are also special interest retreats which are run throughout the year, including amongst others, an introduction to holistic Aromatherapy, Yoga Asana courses, and poetry. Thirty en-suite bedrooms have all been designed to allow guests to reach deep levels of relaxation, and all come with modern comforts such as cashmere duvets, eco toiletries and soft bamboo mediation blankets. Next door to the Peace Palace is the Maharishi Ayurveda Health centre. Ayurveda means ‘the science of life’ and its practice has been in clinical use for more than five thousand years. It utilises the natural links between mind and body which enlivens the system, and helps the body heal naturally. The centre offers personal health consultations, revitalisation therapies, health and beauty products, and educational books and videos. In the past, we have had several consultations with an Ayurveda specialist and they have always been fascinating, practical and enlightening, and we have incorporated many of the wise health tips and practices into our daily lives. After the success of a recent, memorable evening of Indian classical music with one of the most sought after mandolin players in India, Sugato Bhaduri, there will also be a further selection of special musical concerts taking place at the Peace Palace going forward. Watch this space! There really is something for everyone at this haven close to the Suffolk Coast: mediators who would like to expand their knowledge and deepen their experience, beginners who would like to learn how to meditate, or those who are just simply looking for some peace and quiet, and deep relaxation.